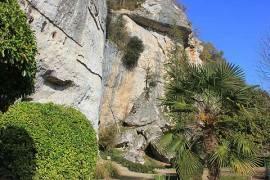 The Grotte du Grand Roc is a marvellous natural cave found half way up a cliff face above the Vezere river. 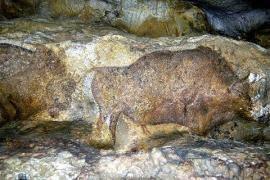 It is just a few kilometers from Les Eyzies and is right next to the Pre-historic shelter of Laugerie-Basse. 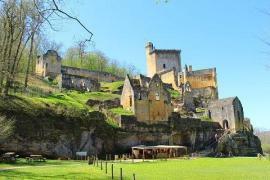 Both the Grotte du Grand Roc and Laugerie Basse are classified UNESCO World Heritage Sites as part of the Vezere Valley classification. From the ticket office there is a short walk to the entrance of the Grand Roc, past a restaurant sheltering under the overhang of the cliff above. 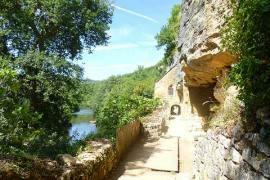 A metal staircase leads you up to the entrance itself from where you get an excellent view of the River Vezere below. A narrow passage through the rock leads you to the main part of the cave. 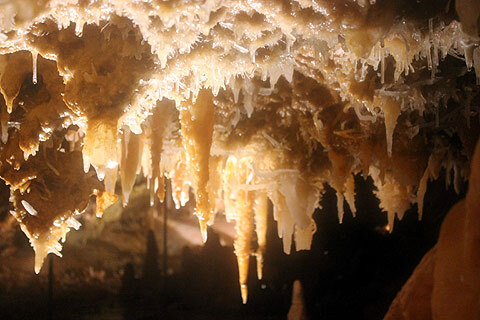 As you walk along this first passage you start to see some openings in the rock filled with small stalactites but nothing to prepare you for what is ahead. 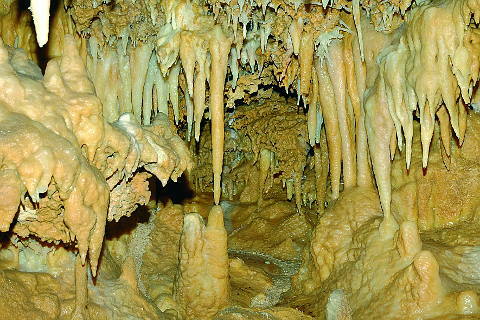 There are few large stalactites, stalagmites or columns in the cave and those there are almost seem out of place in this enchanted space. 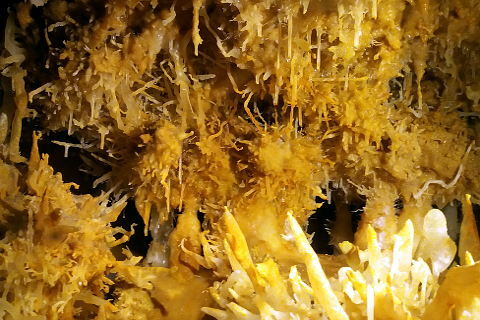 The magic is in the sheer number and amongst them are thousands of the rare 'excentriques' which are tiny stalagtites of only a few centimeters long and about the thickness of a pencil but they shoot out in all directions in a manner which seems impossible and totally unlike your usual vertical stalactites and stalagmites. Similar in size to the 'excentriques' are the 'fistuleuses' which grow straight but remain very fine and delicate even when quite long. Another very unusal formation are the triangles. These are on the floor which and form an area covered in perfectly formed triangles. 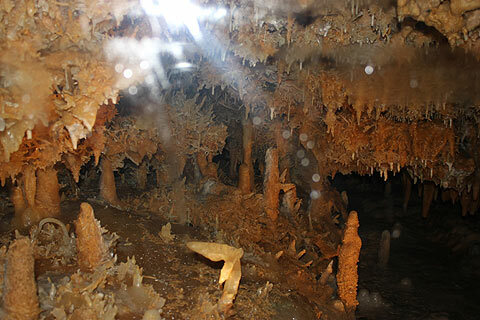 Apparently what we are seeing here is only the top and below is a long triangular shaped formation. Indeed on the way out you can see some in 3D with the 'prism' shaped secretions below. 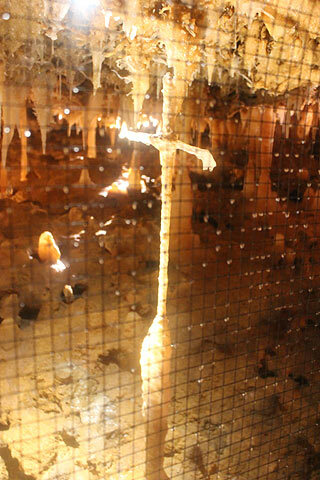 In one part of the cave there is a column which has grown into the shape of a cross. 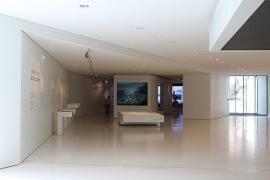 There are also a number of loops and arches and one that looks like the tail of a whale emerging from the floor. 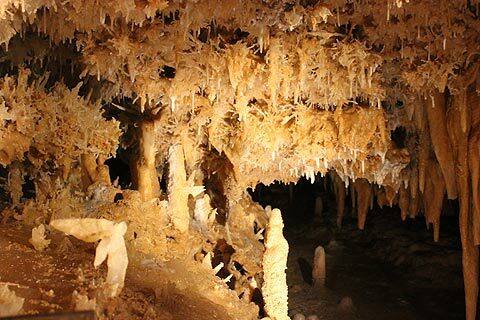 Evening visits to sights in the Dordogne are becoming ever more popular and the Grotte de Grand Roc is now open for a night time visit on Monday evenings at 8.00pm in mid-July to mid-August. 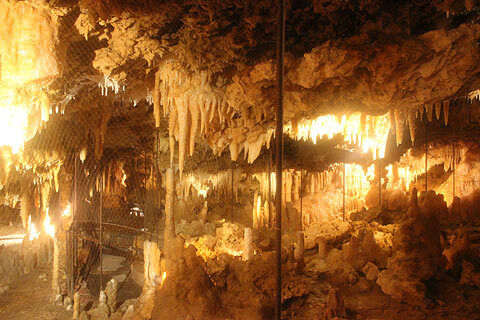 On these visits the caves are explored by torchlight in the way they would originally been discovered by Jean Maury in 1924. 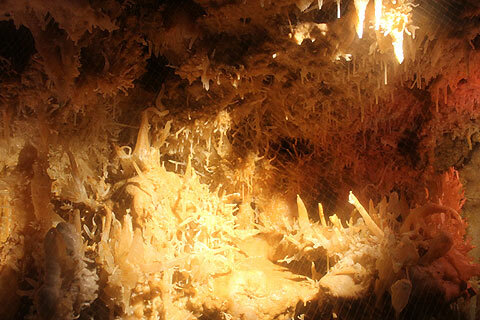 At the end of the visit the caves are illuminated so that you can see them in all their glory. Night time visits cost 15 euros for over 12s and 9 euros for 5-12 year olds. Visits last about 1 1/2 hours. 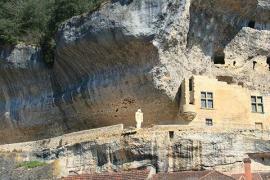 The evening visit is a combined Grotte du Grand Roc and Laugerie Basse visit. Over 12s 7.80 euros, 5-12 years 5.30 euros. 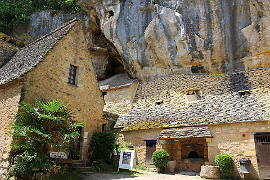 The prehistoric shelter of Laugerie Basse is next to the Grotte du Grand Roc and shares the same ticket office. If you visit both at the same time you get a reduction. 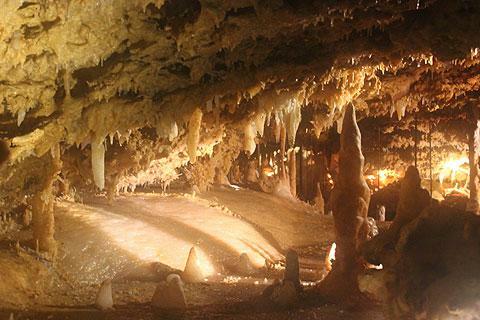 Les Eyzies is very close and is at the centre of dozens of natural and pre-historic caves. The Font de Gaume cave a couple of kilometers away is one of the few caves still open to the public with prehistoric polychrome paintings.